Before you start, think about time. 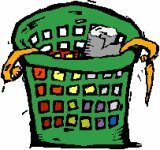 Only take out as much stuff as you know you can sort, put back and tidy up in the time you have available. If there is a chance you might be interrupted, then only tackle a small area (one drawer, one rail, one shelf) at a time. That way you won’t be left with the demoralising situation of having grasped the nettle to de-clutter but ending up with more mess, just because you ran out of time to complete the task. As with de-cluttering anywhere, remember the golden rule: Store as little as possible. Be ruthless - keep only things that are useful, beautiful or seriously sentimental. Get rid of everything else. If in doubt, ask yourself “Would I pay to store it?” Be realistic – you probably won’t ever get round to altering that hemline and you will probably not slim down to that size again! The best way to decide objectively which clothes you don’t actually wear is to turn all the hangers round one way (say with the open side of the hook facing outwards). Make a note of the date and choose a period of time, perhaps a few weeks or a season. 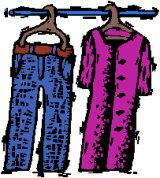 During this period, when you wear and then return an item to your wardrobe/closet, turn the hanger round the other way. At the end of your chosen time period, simply remove any item with a hanger still the original way round. 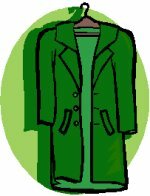 Getting rid of an expensive item that you’ve only worn a couple of times but for whatever reason are unlikely to wear again is painful. Getting some money for it by selling to a “nearly-new” shop or on eBay can help. Otherwise, put it in the charity/thrift shop bag with the thought that there will be two winners – the charity and the new owner. Resolve that in future you will spend serious money only on basics/classics that you will wear many times, spending less on each fashion item. A simple way of making more space in your wardrobe/closet is to only hang the things that really need to be hung. Knitwear, t-shirts, casual trousers and jeans can all be folded and kept in drawers or on shelves. Heavier items, such as long jersey dresses, anything with heavy ornamentation and chunky knits should not be hung up, to avoid distorting their shape. Remove all out-of-season clothes, such as winter coats and jumpers or beachwear, and store them somewhere else, packed in your suitcases. Divide the clothes amongst several large carrier bags, for quick removal and re-packing when you need to use a suitcase for a trip. Divide and conquer small items, such as socks, underpants, knickers, bras, tights/pantyhose and handkerchiefs by keeping each together in shoeboxes, biscuit boxes, small baskets or drawer dividers. Scarves, belts and ties can alternatively be looped through a hanger, or hung from hooks, bars or cords fixed on the inside of your wardrobe/closet doors. Storing shoes tumbled all together in the bottom of your wardrobe/closet is not ideal. Shoes should be stored so that they are easy to find, stay in pairs and don’t get damaged. a shoe-width shelf, preferably at about eye level. You will be able to store more shoes in a given length of shelf if you place the pairs with left and right facing alternately toe forward and heel forward. Keep tall boots from slumping over and creasing by storing with boot trees or (as a less expensive option) empty washing-up liquid or soft drink bottles pushed down them. To prevent build-up of clutter in the future, as well as periodic clear-out sessions, keep the status quo in between times by operating the “one in, one out” rule. For example, if you buy a new skirt, remove an old one and take it to the charity/thrift shop.